This "Dovetail" was found several years ago in Monroe County, Missouri. It’s made of a glossy black chert that seems to be Pitkin chert from Missouri. This point is beveled from resharpening and was most probably used as a knife and originally would have had a short handle hafted to it. This point measures slightly over 6 ½ inches long. The original point has had two minor restoration repairs done to the base and one blade edge. 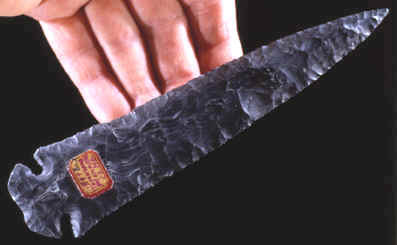 This is a very fine example of these Early Archaic knife forms. 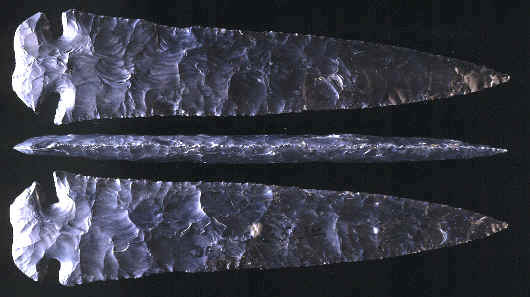 St. Charles points were first named by Edward G. Scully after St. Charles County, Missouri where many examples have been found. Most of these points appear to be knives that would have been hafted onto short handles made of antler, bone or wood. They were resharpened when they became dulled or broken by beveling the edge with a technique known as pressure flaking. Pressure flaking can be done with an antler tine or a tool made from copper or even with other materials. St. Charles points have been and are still called "Dovetails" by collectors. These points range in size from just under 2 inches to over 10 inches in length. There are several different variations of these points. In the Ohio area St. Charles points have a much smaller base and are called "button based Dovetails" by some collectors. Other points have large round bases and still others have more of a straight base. Most of the basal notching is at an angle but a few rare examples are side notched. 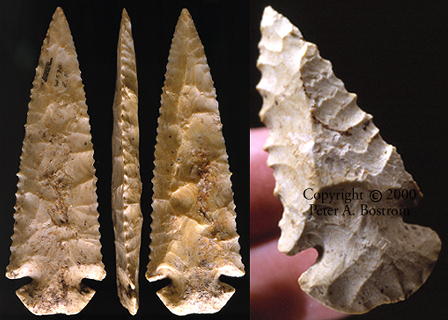 These points date to the Early Archaic period and are contemporaneous with Hardin and Scottsbluff points. An estimated date for these points range from 8000 to 6000 B.C. Graham Cave in Missouri produced dates for St. Charles and Thebes points from approximately 7530 to 7340 B.C. St. Charles points are widely distributed throughout the eastern United States. Many have been found west of the Mississippi River in Missouri, a few in Oklahoma and a handful are know from northeastern Texas. This picture show a triple exposure of the original Monroe County "Dovetail" from which the cast was made. The two "Dovetail" points pictured here are typical examples of the style found in southern Illinois. The one on the left was originally in the Madison County Sutter collection and was most probably found in either Madison or St. Clair Counties. It's made of Burlington chert and measures a little over 3 3/4 inches long. It has been resharpened one or more times. The St. Charles point in the picture to the right was found by myself in a cultivated field on my farm in the spring of 2001. It's been extensively resharpened and is now steeply beveled. It's most likely that it was finally discarded by the original owner as no longer usable and replaced with a newly made St. Charles point that was hafted in his knife handle. 1985, "Selected Preforms, Points and Knives of the North American Indians vol. 1", pp 332-333. 1987, "Stone Age Spear and Arrow Points", Noel D. Justice, p 49.